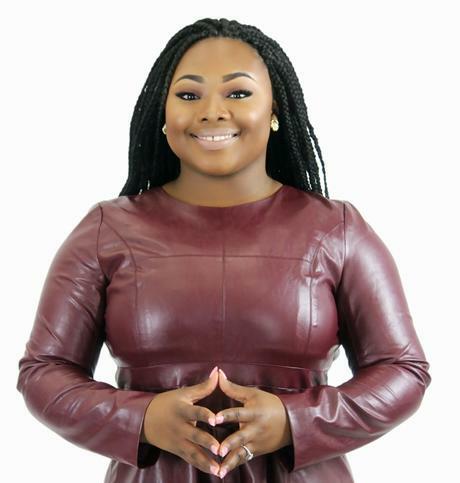 Jekalyn Carr “You Will Win” conference has announced its first round of Guest Speakers and Workshop Facilitators. 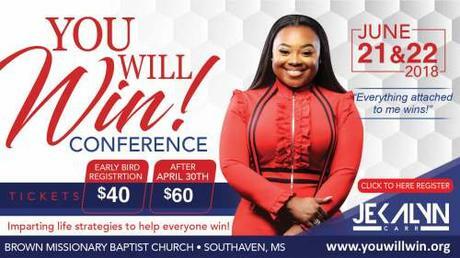 Independent artist, actress, published author, and charismatic motivational speaker, Jekalyn Carr, along with Hallelujah 95.7 and Lunjeal Music Group have partnered together to bring the inaugural You Will Win Conference. The 2-day conference will feature a variety of diverse high-level speakers, workshop facilitators and panelists throughout 14 breakout sessions, including Impact Networks TV Host Ambassador Dr. Bobby Jones, TV/Film Producer Keith Neal (Saints & Sinners, TVOne, BET Networks) of Swirl Films, Tia Smith, Sr. Director, Original Programming & Production for TV One, and Angela M. Jollivette, Music Producer for OWN Networks Greenleaf Soundtrack; President of Gospel Music Association Jackie Patillo and Howett Owens of McDonalds Tours, who will discuss TRADE & TOURING, and more. The nightly services will consist of speakers such as, Prophet Jonathan Ferguson and Prophetess Carr and you can expect life changing messages. 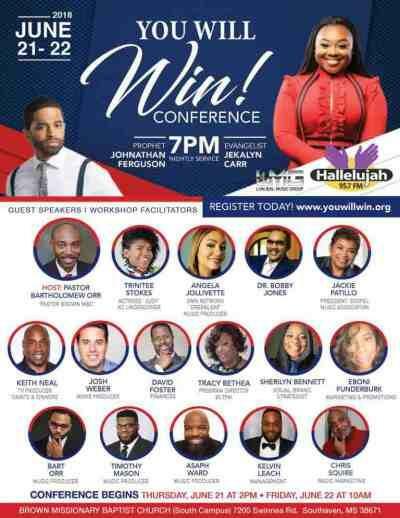 This is a conference that will inspire your whole household. The focus of the conference is to educate, offer growth and to help you incorporate God in everything that you do.